Lifeway Frozen Kefir is 99% lactose free, 100% gluten free, and packed with healthy probiotics. Photo by River Soma | THE NIBBLE. WHAT IT IS: A frozen version of the traditional yogurt-like drink, kefir. WHY IT’S DIFFERENT: It’s the first frozen kefir. Compared with frozen yogurt, it has even more healthful bacteria and yeasts. WHY WE LOVE IT: We love the taste and the healthiness. Our lactose-intolerant friends will love the ability to enjoy frozen desserts again. WHERE TO BUY IT: Central Market, Food Emporium, Gristedes, Natural Grocers, Sunflower, Wegmans, Whole Foods Markets and other fine retailers. If it isn’t in your store, ask the manager if it has been ordered. It may be on its way. Find reviews of more of our favorite frozen treats. Cooking Video Of The Week: Jasmine Tea Shaved Ice, perfect for hot weather and so easy to make! issues archive and our most popular articles. in chronological order and product category. CAPSULE REPORT: What frozen dessert is 99% lactose free, gluten free and only 90 calories per serving? If you guessed sorbet: Close, but no cigar. Most sorbets are made without dairy, and are 100% lactose free. 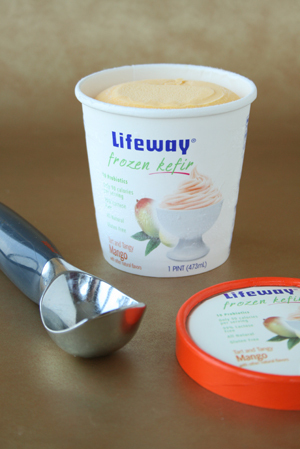 The answer: Lifeway Frozen Kefir (pronounced kuh-FEAR). Kefir is similar to yogurt, but with even more live and active cultures. Kefir is a symbiosis of a number of different bacteria and yeasts, which form masses called kefir grains. It is comparable to a drinkable yogurt, but is even healthier. Kefir is available in supermarkets nationwide. You can also buy the grains and make your own from milk. Kefir contains the probiotic bacteria found in probiotic yogurts, as well as beneficial yeast. Both the yeast and the bacteria are naturally occurring. The drink is loaded with vitamins and minerals and contains easily digestible, complete proteins. Kefir is often called a “super yogurt,” since it is up to 36 times more probiotic than yogurt. It’s conventional, drinkable kefir churned into a delicious and healthful frozen dessert. Frozen kefir is a real find for the growing number of people who discover that that they are lactose intolerant (or suspect that they are). A tart and tangy treat—like the popular and trendy Pinkberry and Red Mango frozen yogurts—kefir is high in protein and calcium. Newly launched by Lifeway, the king of kefir, this frozen kefir line is all natural and available in four flavors: Mango, Original, Pomegranate and Strawberry. It’s hard for us to choose a favorite; we like them all. However, the Mango was surprisingly newstyle—not oldstyle tangy and tart. So if you don’t like tangy, it will be your favorite. If you do like tangy, start with another flavor. These guilt-free pints of frozen delight are waiting in your grocer’s ice cream case—or will be there soon. The line is certified kosher by CRC. Head to the next page to see how beneficial kefir is. But first, take a peek at the article index below. THE NIBBLE has been reviewing the finest foods in America since 2004. Our recommendations are based purely on our opinion, after tasting thousands of products each year, that they represent the best in their respective categories. Product reviews are by a unanimous vote of our Editorial Committee. We do not accept placement fees: All products have earned their way into our webzine due to excellence. 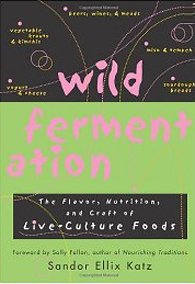 Wild Fermentation: The Flavor, Nutrition, and Craft of Live-Culture Foods, by Sandor Ellix Katz. How to use natural fermentation processes to produce bread, yogurt, cheese, beer, wine, miso, sauerkraut, kimchi, kefir and other fermented foods. More information. 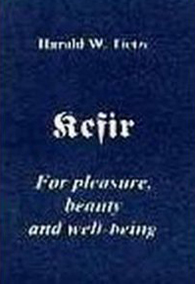 Kefir For Pleasure, Beauty And Wellbeing, by Harald W. Tietze. Why kefir is so outstanding for health, and lots of recipes that will help you integrate kefir into your lifestyle—both for food and for skin care, including makeup re-moval and cleansers! More information. 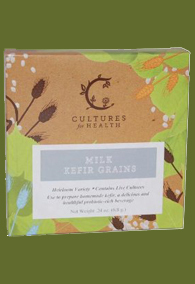 Milk Kefir Grains, by Cultures for Health LLC. Add kefir grains to milk (or soy or coconut milk); in 18 to 48 hours, you’ll have homemade kefir. It can be flavored with fruit or flavor extracts for delicious beverages. A healthy and easy undertaking. More information. A labor of love: It takes some labor, but you’ll love the results. Make it at home, and make it even better than store-bought.